Eglinton asylum opened in 1798 under the name the Cork district lunatic asylum. It was the second lunatic asylum to be built in all of Ireland and was created by a man named William Saunders Hallaran. He was the author of the first book on Irish psychiatry and made an invention called "Hallarans Chair", which was basically just a chair where the patient would be strapped to tightly, and then it would rotate at the speed of 100 rotations a minute, which apparently seemed like a cure for something at the time. In 1845 the Irish lunatics asylum act called for a larger and more capable treatment centre for people of an unsound mind and this created two new asylums. The first was at Dundrum which was to be for the criminally insane, and the second was to be a new building to replace the old and much smaller building of the Cork district lunatic asylum. The old asylum was torn down and a new one designed by local architect William Atkins, which is the building that stands today. It opened its door in 1852 at a total construction cost of £79,827 which was a huge amount of money at the time. 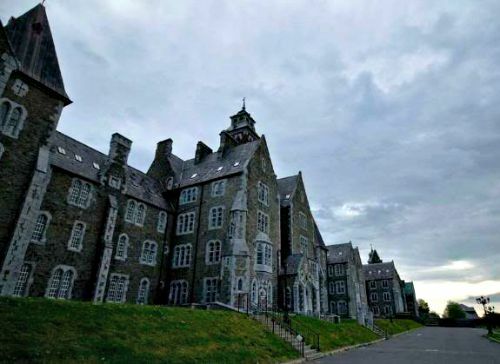 Named after the Earl of Eglinton, Lord Lieutenant of Ireland, the new building of Eglinton asylum would serve the whole county of Cork and have people of all ages sent there who were considered "insane". The asylum continued to operate until the early 1900's when it was renovated and had a change of ownership and renamed as "Our Lady's Hospital". The facility closed down during the 1960's and stood abandoned for many years. Today it is under new ownership and the whole building has been renovated and turned into apartments. Any asylum that existed in the 1800's was somewhere you should avoid at all costs, no matter how badly you needed help. The lack of understanding about mental health caused so much unnecessary suffering and death, and that combined with the staff trying to treat people for things they did not have and the severe lack of proper medicine meant you would be better off homeless than in a building such as this. People were sent to asylums such as this one for things that the governing health organisations considered to be signs of mental illness. These signs included things such as swearing, masturbation, adultery and general illness's. Since Ireland has always been a very religious country, this also contributed to the type of people who were sent here, with unwed mothers being sent here and forced to "wash away" their sins with tasks such as doing laundry for 12 hours a day. These are only some of the ridiculous reasons people came here, and with so many innocent people receiving medicine that really wasn't medicine, and with treatment such as the Hallorans chair, there's no wonder the building saw a huge number of deaths. As for actual paranormal activity here there are all the usual claims you may expect, with things such as strange sounds and apparitions, normally of the inmates though some people have claimed to have seen the spirits of nurses, strangely always reported to be crying. The sounds are the most frightening though, according to the stories. Where the treatment rooms on the second were, strange sounds have been captured on numerous occasions. The sounds of muffled screams and people struggling have been heard, though upon inspection of where the noises were coming from, the area is always empty.